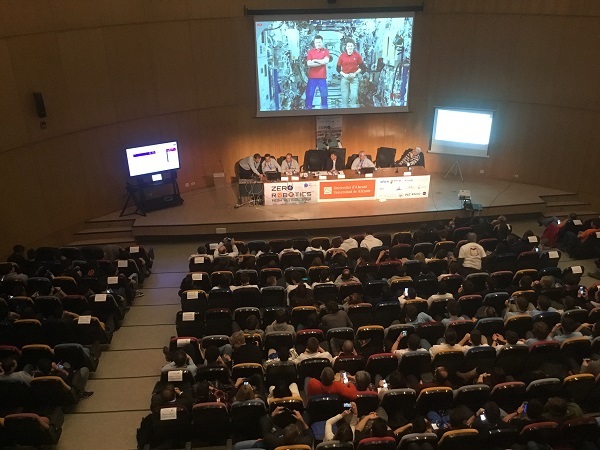 Zero Robotics ISS Finals 2019, an international robotics tournament organised by NASA and Massachusetts Institute of Technology (MIT) has just started at University of Alicante. The opening ceremony has given way to the presentation of the participating teams, broadcast live by video-streaming. This same connection system will be used with the International Space Station and the UA. Through this connections from Alicante, Sidney (Australia) and Boston (United States) the teams of students who have joined the tournament have been greeting each other. Antonio Martínez-Álvarez is the Spanish coordinator of the tournament and chairman of the event local committee. He is also a senior lecturer at the UA Polytechnic School Department of IT and Computing and has explained the operation of the tournament and has regarded the experience of hosting this international event by the UA as highly positive.